Le VPN is a Hong Kong based virtual private network (VPN) provider with 800+ VPN servers in 114 countries all over the world. It’s a convenient way for a user to change his IP address and bypass any restrictions with ease. The company has an innovative HybridVPN service to speed-up the streaming of geo-restricted content that we will discuss in this Le VPN review. The company has started its business in France (hence the name) in 2010 and has since grown into a global company holding its own in the international market. Let’s look at what Le VPN has to offer. There is a lot going on here. 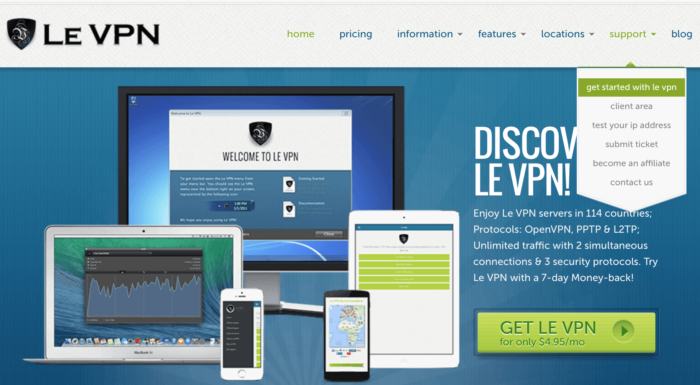 Le VPN offers a multitude of features that combine for one enjoyable experience. Coverage will never be an issue. LeVPN servers list offers 800+ VPN servers with IPs in 114 countries around the globe, representing each continent. You can switch servers at any time without limitations. The free VPN software developed in partnership with SparkLab’s Viscosity is compatible with Mac and Windows. As you configure and learn to use the software, additional guides are available should the need arise. 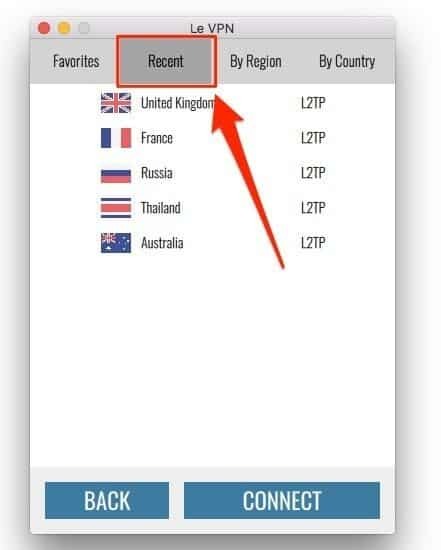 Free iOS app for iPhone and iPad is also included which is rather handy as Le VPN allows two simultaneous VPN connections on two different devices. In July 2017 Le VPN has released even the Android App. Peer-to-peer (P2P) and file sharing support is also available, although torrents and other P2P connections are only available in Canada, Czech Republic, Luxembourg, and the Netherlands. There are three price plans available – one month, six months and a yearly subscription to the service. Each plan comes with the same features included so the only decision you have to make is how much you want to spend. 1-month subscription cost $9.95 which is of course the less convenient plan you can subscribe. Six months cost $7.50 a month, while the one year plan is $4.95 a month which is an interesting price for the service you will get. Payment methods include support for a number of credit cards, PayPal and many other payment processors. 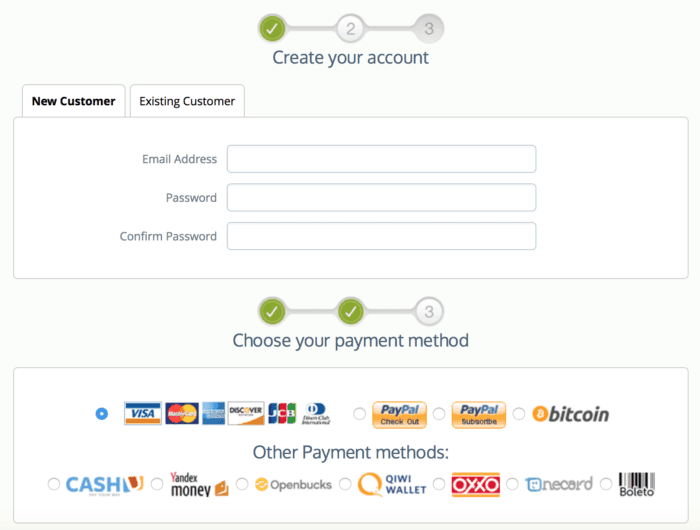 Le VPN accepts payments Bitcoins which is a feature we always appreciate in a VPN providers. Paying with Bitcoins makes your payment entirely anonymous and not traceable. This is perfectly in line with what a VPN service is for which is to protect your privacy online. 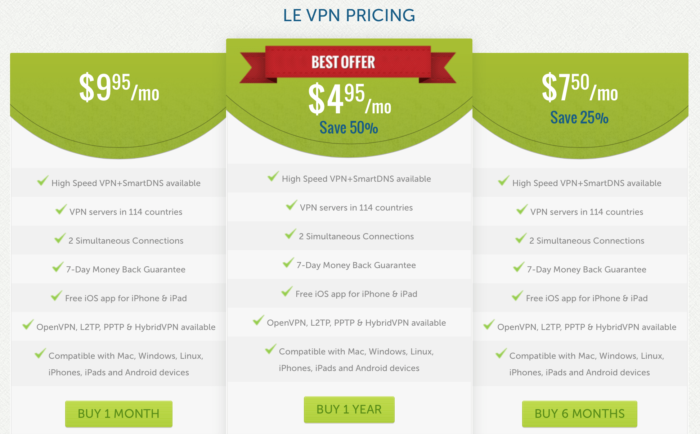 Le VPN offers a 100% money-back guarantee for seven days which can serve as a sort of a trial. You can subscribe to any plan, test Le VPN for several task and if something is not up to your expectation you will get your money back. The process is fairly simple and newcomers to the VPN experience will have no problem managing it for the first time. To register, an email and a password is required and, of course, you need to select a payment method. No personal info is requested, which makes for added user’s privacy. For the registration process your personal info are not required. After you’ve registered, there is a dedicated Client Area section at the Le VPN website from which you can download Le VPN client. 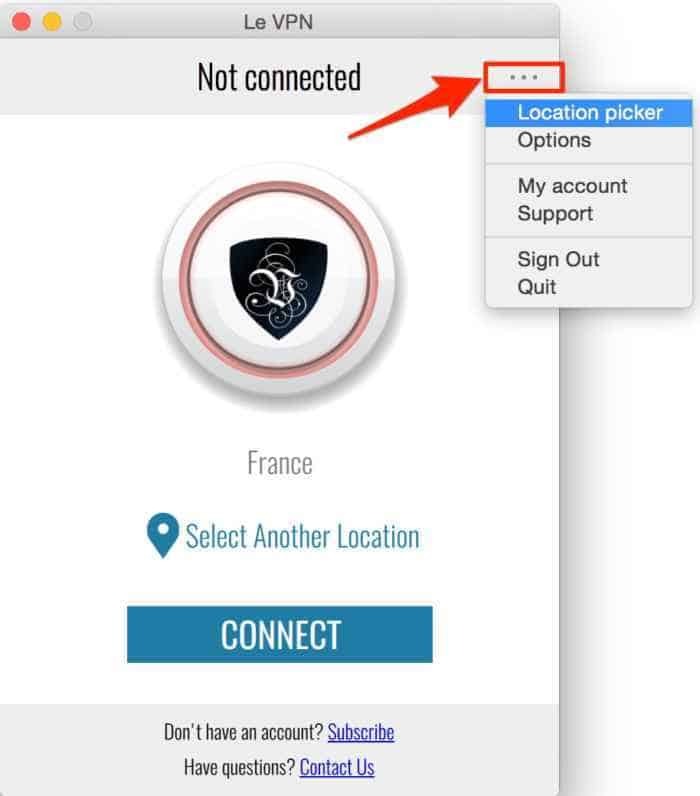 To download Le VPN the software, you have to click on the top menu “Support” and select “Get started with le vpn” from the drop-down menu. You will be redirected to the page where you can select the installation you need. 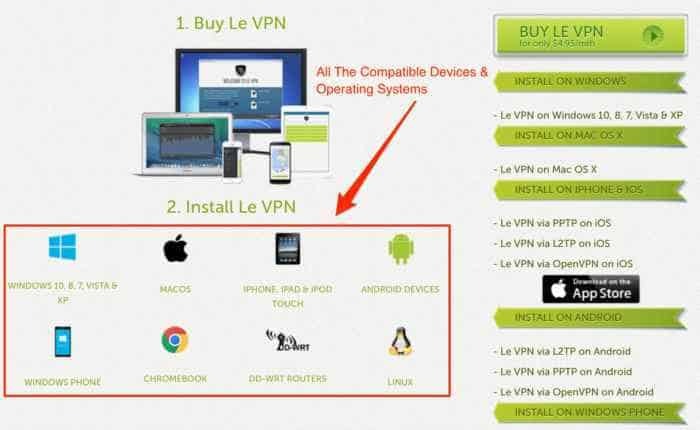 Le VPN has software for Mac OS X, Windows, iPhone and iOS, Linux,Android, Windows Phone, Chromebook and DD-WRT Router. After you download and install the software, a window will pop up where you have to digit your username and password to access Le VPN service. After you log in, you will see a welcome page. 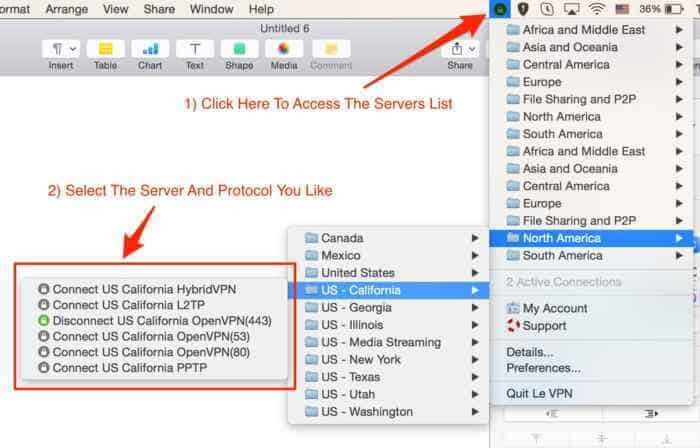 The page displays some quick info on how start using Le VPN immediately or, if you like, you may get into some tutorials to get accustomed with the service. The website is quite easy and intuitive to navigate, so we believe you shouldn’t have any problem finding your way to Le VPN login and software download. For you reference, the client area is under the menu “support”. As you hover the menu, you will see a drop-down menu where you will find the client area. To be honest, the font size of the menu (and of the all website in general) could have been a bit bigger to make the info more readable. The client gives the user a lot of technical options and it is quite fast. 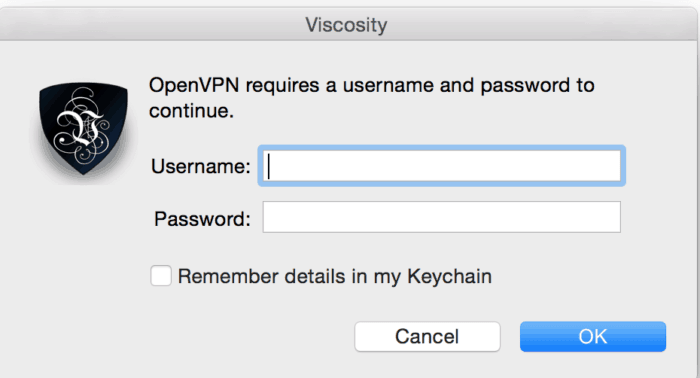 Whether you install Le VPN on your Mac or Windows, the provider use a version of the Viscosity VPN client. The Viscosity software is not available on Linux. As you click on the icon, a drop-down menu will show the list of all the main regions where the servers are located. 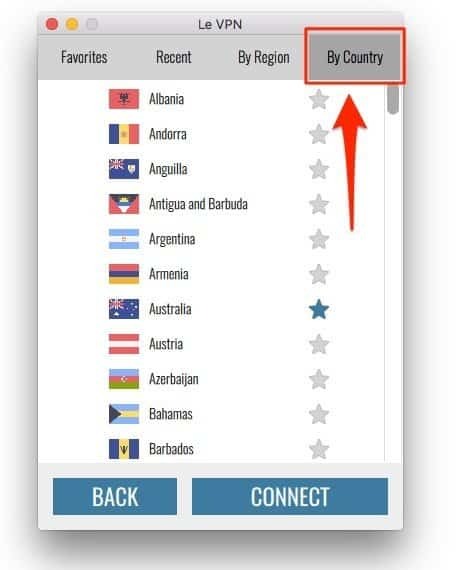 Once you select the country where you want to connect from, you will see all the VPN servers available and the different VPN protocols they support. The VPN protocol to choose depend on the level of security and speed you need. Select OpenVPN for top security, PPTP if you need low security but higher speed and HybridVPN to combine security and fast speed for streaming contents. About HybridVPN, we will discuss its features in a while. Before you can connect to the server you will be requested your username and password. The same procedure is needed every time you switch to a different server, which is slightly annoying. Anyhow, you can add your credentials to your keychain to speed up the process. 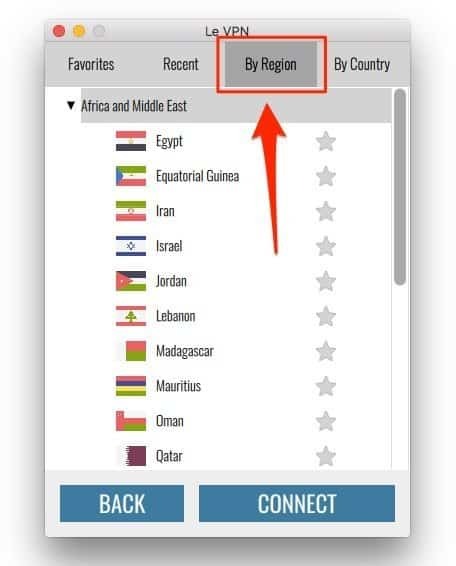 The drop-down menu gives access to more options to customize Le VPN client. You will find very useful the menu “Details”. Clicking on it, you will see a window that shows the status of the connection, the current IP and the performances of the selected VPN provider. This windows is quite handy to find a well performing VPN server. 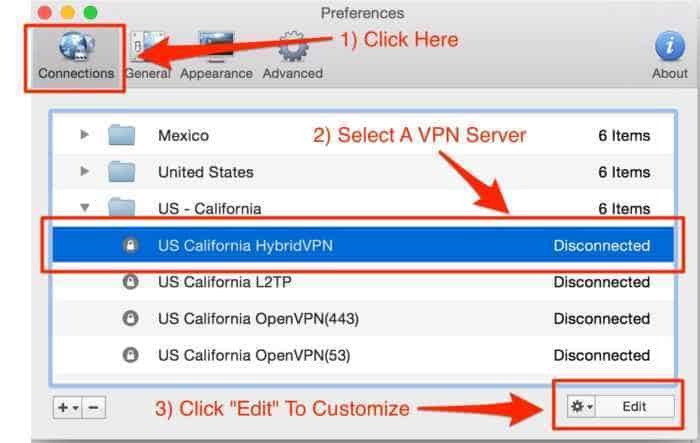 Through the menu “Preferences” instead, you can easily customize the VPN client. Some of the customizations are not particularly crucial like, for example, the possibility to change the top bar icon’s look. Others are more important like for example the option to automatically reconnect active connections on wake. This feature will add to your security in case you forget to manually activate the VPN on wake. From here you can even customize all the connections. You can do that entering the menu “Connections”, clicking on a VPN server and then “edit”. 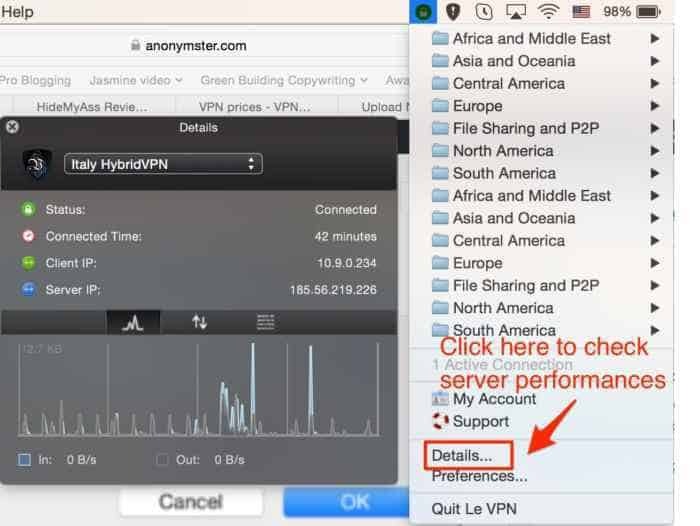 From here you can change several parameters of the VPN connection but this section is only for advanced users that know what to do. Normal users do not need to get into this section so, do not play with it if you don’t know your way around. LeVPN has released an entirely new Mac OS software. We installed the new client to have a look at it and we are quite happy with this new client. It is well designed, easy to use and in just a few clicks you can totally control your Le VPN service. A major improvement in usability compared to the classic Le VPN client. As you open the client, you will have a window with a big button to easily activate the VPN and a large icon that shows to which VPN server you are connected and the status of the connection. To switch to a different server is very easy. You just click on “Select another location” and you’ll be redirected to a page where you have total control of your server. Here you have the VPN servers divided by country and by region. You have even a list of the most recent VPN you have used and can even create a list of favorites. 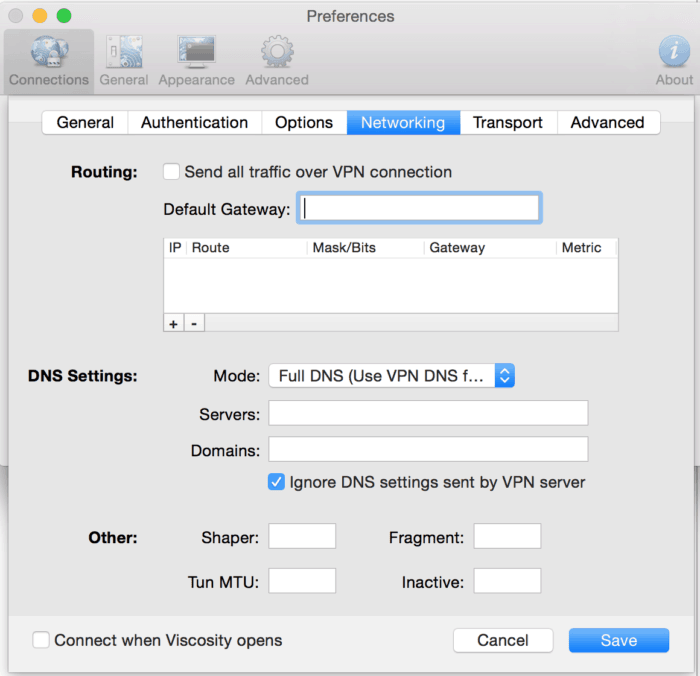 We have found very easy to manage VPN servers with the ne Mac OS client. 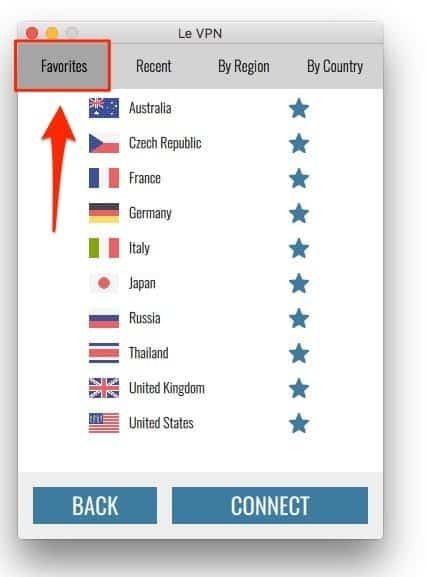 On the top right corner of the main client page, you have a drop-down menu that gives you access to additional functions to customize your VPN connection. From here you can even directly access your account and the customer support. Most important, when the final version will be released early 2017, a killswitch function will be included. We are very happy about this news because the killswitch function is extremely important to guarantee your privacy and security. In case of a service drop, the killswitch will automatically disconnect you from the Internet. In this way accidental leaks of information is prevented and your privacy is totally safe. One of the standout features is the innovative HybridVPN service, a mix between a SmartDNS and a VPN that provides the fastest VPN service connection. Unlike a VPN, a SmartDNS service allows a change of regions without any device configuration while still allowing users to browse local websites. For instance, you can access and watch TV channels and some streaming services that are originally unavailable to you. HybridVPN combines the two, passing all the traffic through a VPN tunnel and automatically unblocking all online media through SmartDNS servers. Just to give you a practical example, if you wan to access geo-restricted streaming content, you don’t need to connect to a VPN server in the country where the streaming website originate. Your server can be wherever you like around the world and the Smart DNS included in HybridVPN will still unblock the content. Thus, you can enjoy the security of a VPN connection while accessing geo-restricted online media at fast connections speeds. It was expected to see speed drop slightly with Le VPN activated. But it was totally surprising to see that the difference in speed was minor. We performed all the test using the same VPN protocol. 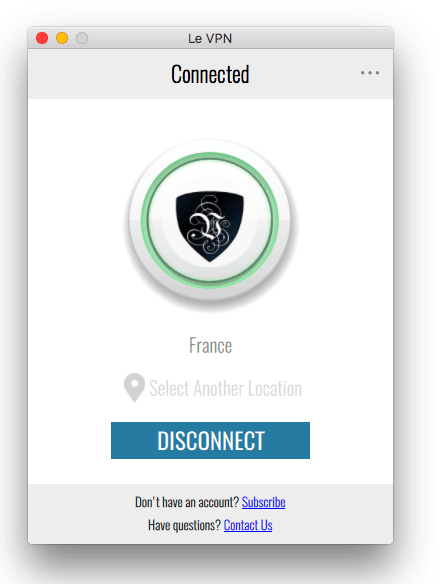 In this case we connected through HybridVPN and our original location was in Europe. This is the connection performance without Le VPN. After we connected to a server in a nearby country and as you can see the speed dropped a bit but the difference is very little. The last try was was with a VPN server located in the USA and this is the most surprising result. We didn’t experience any difference in speed. We performed the same test several times and in different hours and the result was always the same. We tried Le VPN with streaming content and we didn’t have any kind of problem. The streaming was very smooth and without buffering. In terms of speed Le VPN performed beyond our expectations. The cornerstone of every VPN service, Le VPN has privacy and security covered with a few of rather welcome options. Privacy-wise, what immediately grabs attention is the claim that Le VPN guarantees confidentiality by not keeping traffic logs. According to their ToS page, they don’t monitor user sessions for inappropriate behavior, nor maintain direct logs of any customer’s Internet activities. Additionally, they do not store private information about any individual user’s activities like emails, chats, websites visited and others. However, Le VPN reserves the right to investigate activities they suspect to be illegal. When it comes to security, the service has multi-protocol support. There’s the standard OpenVPN protocol used mainly for desktop devices and L2TP over IPSec and PPTP protocols for securing mobile devices, in addition to OpenVPN. Thanks to the AES-256 algorithm used for encryption, third-party intervention is prevented. 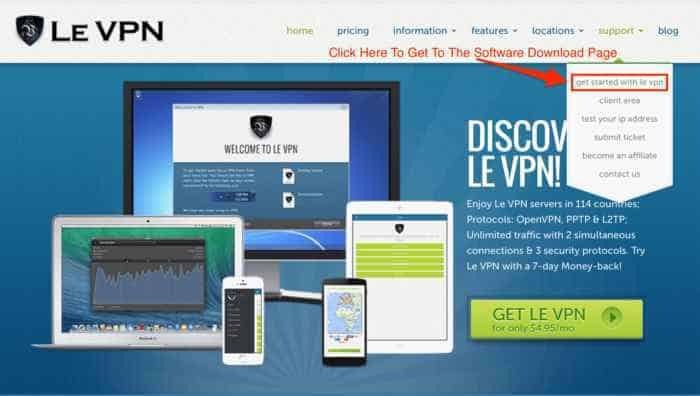 The client area of the Le VPN website includes a knowledge base consisting of manuals for installation of different devices and operating systems, FAQ, SmartDNS and a server list, among others. Most of the things you need to know are there. Unlike other VPN providers, Le VPN has live customer support but is not available 24/7. The live chat is available 7 days a week and works on two different shifts to cover different time zones. You just need to check what time they are live in the country you live. Anyhow, you can use the standard ticket system to receive technical support or resolve any issue regarding sales and billing. We have found Le VPN ticket system pretty good. Depending on the message priority, the response time is within a couple of hours and helpful. There might be a bit of a back and forth with additional emails if you want to go beyond the basic response. 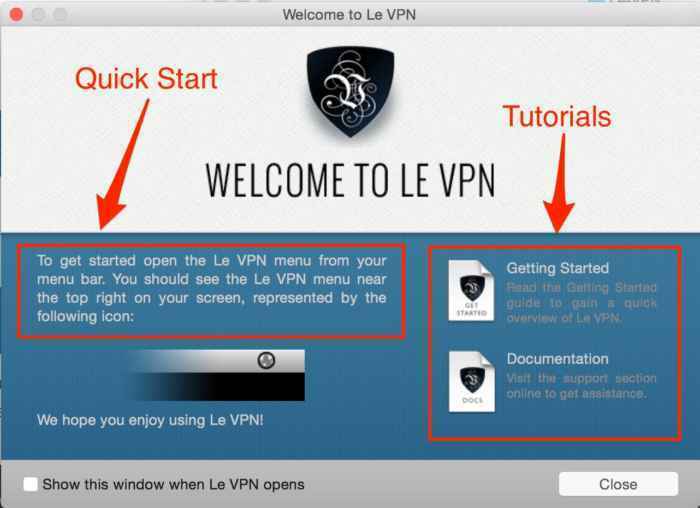 Le VPN offers a consistent VPN experience that is reasonably fast, secure and easily accessible. As with every service, it has some pros and cons. There’s much to like about Le VPN. Ample coverage with various server locations to choose from is a huge plus. The HybridVPN feature is a winner from the start, combining the best elements of VPN and SmartDNS. There are no logs of your activity so you can securely use the service with complete ease in your anonymity. The custom client makes the whole process a lot easier, even if the software could be a bit more user-friendly. Two simultaneous connections on two devices is a nice touch. Credentials requested every time you switch server. All in all, Le VPN is a reliable solution. It’s great for users who have restricted access in their countries and need to access social media, for instance. It’s quite convenient for online media streaming due to a large number of available servers and fast connections. While not the cheapest of the bunch, it’s certainly not the priciest either. If you manage to catch the frequent special offers, the service will be well worthwhile. Still, with the seven-day money-back guarantee, you really can’t go wrong with trying it.